Light, material and space establish a symbiotic integration in this unique interior design which required many custom luminaires, use of advanced technologies and specialized mounting details to assure aesthetic interests and practical requirements were met. This highly customized design was developed in close collaboration with the interior designer and lighting manufactures. Numerous full scale material and light mock-ups were required as well as development of custom luminaire prototypes. Each element was meticulously detailed and repeated throughout the space in support of the conceptual design. Aesthetic aspirations had to also meet stringent code requirements including energy limits for LEED certification and local health code illuminance levels which dramatically exceed IES recommendations. The interior is subdivided by high-back banquette seating with an articulated folded ceiling that reinforces division of the floor plan and separates circulation pathways from dining. 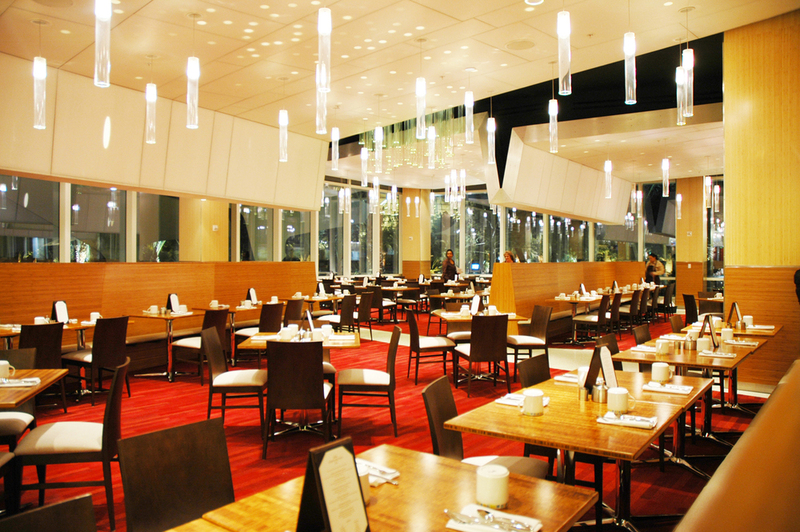 As a result, the large 23,000sq/ft space offers intimate dining experiences while not obstructing long views. The folded ceiling is transversely intersected with “Milky Way” light constellations composed of luminous dot patterns at the ceiling surface and custom glass tubular pendants that add spatial dimension to the dining area. The pendants are spaced strategically in a perceived random pattern to reinforce the organic flow of the constellation while also providing the required 10fc illuminance throughout the open plan dining area. Light coves with cut apertures behind the stretched fabric ceiling complete the layered constellation interest of fluid luminous movement. 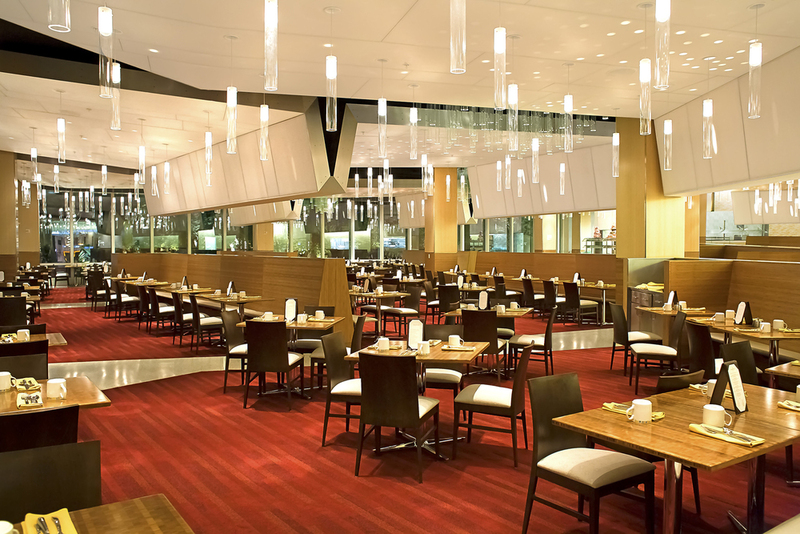 The fabric ceiling is interrupted at the circulation pathways with interest in further subdividing the dining area and reducing the overall spatial scale. 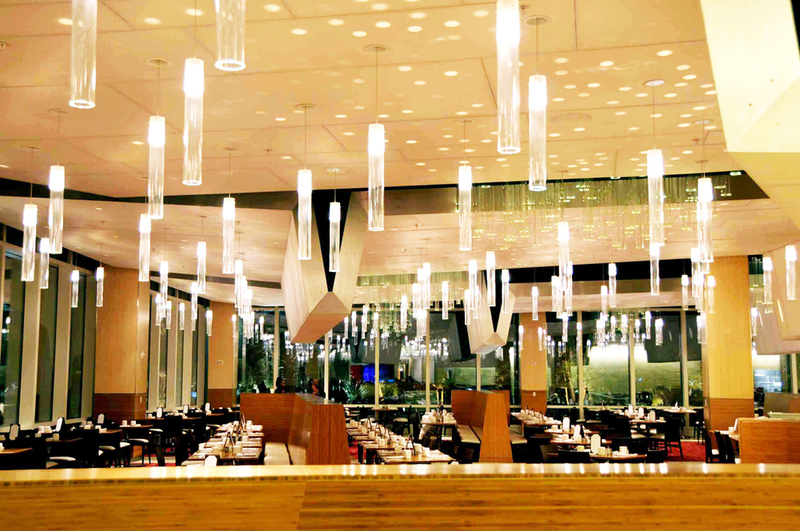 In turn, the lighting design changes form to densely spaced floating glass chandeliers. 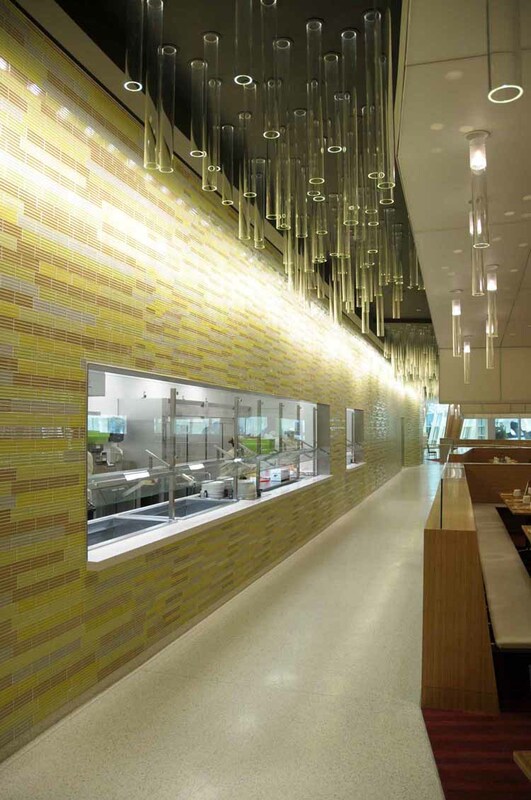 As a contiguous backdrop to this highly active interior design, the multi-colored tile wall wrapping the perimeter is brightly illuminated as a continuous backdrop to the buffet, service area and entry. Distance viewing of this vertical feature offers way finding orientation for dining guests.